NEW EVENT! 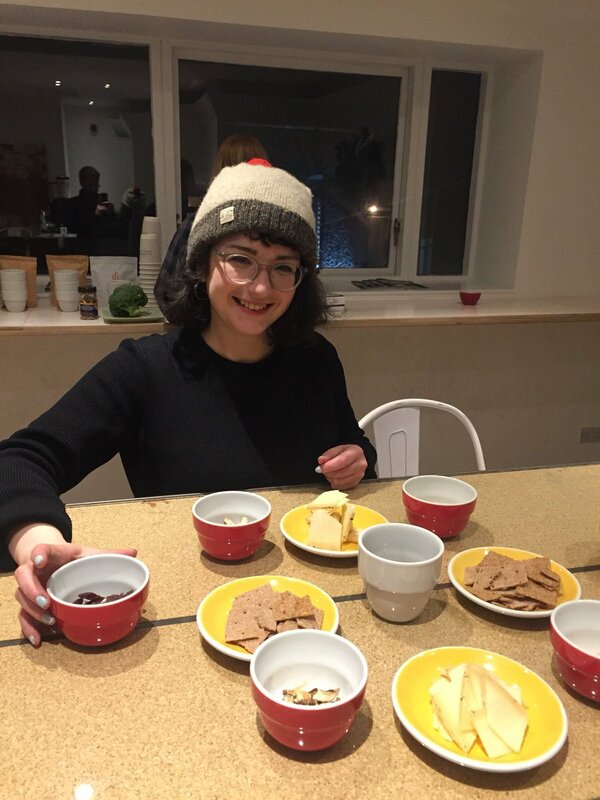 Join Susie Kealy from The Barn Berlin for a special UMAMI WORKSHOP in our Montague Street coffee shop on Tuesday, January 23rd. Susie will present this sensory session that should not be missed. Umami is a scientifically recognised fifth basic flavour; along with sweet, sour/acidity, bitter and salty. It was only acknowledged at the beginning of the 20th century, and is said to describe the ‘meaty’ or ‘savoury’ flavour that appears in, among other things, cooked meat, vegetables and cheese. 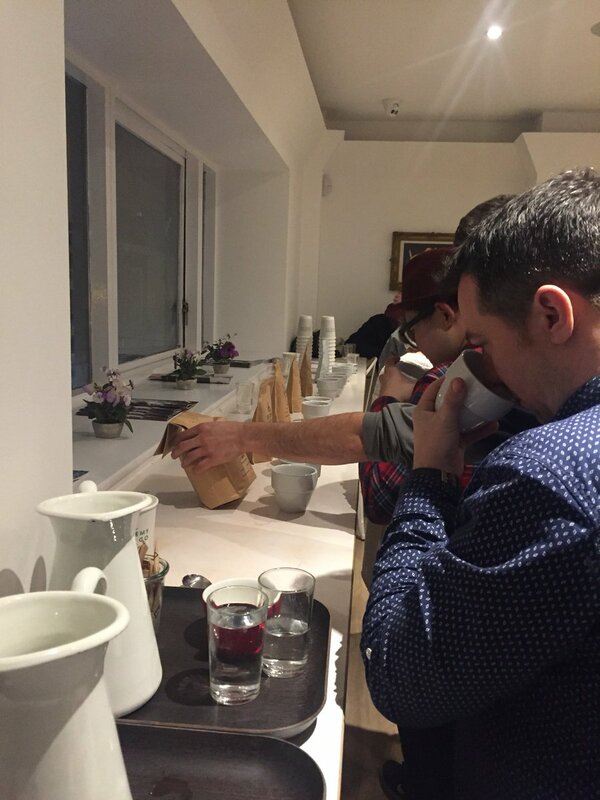 This sensory workshop will be an introduction to this fifth taste and will include tasting of various water solutions, food items and, of course, cupping different coffees. Refreshments and snacks will be available. People have been asking us for this Domini Kemp recipe for our Sticky Toffee Pudding with Dates, Pears and Crème Fraiche, so here it is . . .
Heat the water, dates and pears in a medium-sized saucepan. Bring to the boil then reduce the heat and simmer, until almost all the water has evaporated and the mixture is all soft. This takes about 25 minutes. It should resemble a puree, but if it’s still a bit chunky you can process until smooth in the food processor. Set aside until the cake bit is made. In a food processor or cake mixer, cream the butter and sugar together until light and fluffy. Reduce the speed and add the eggs. Sometimes the mixture separates and starts to look like sour milk or something equally yucky. If this happens, add a spoonful of flour and give it a whiz. Things should return to normal. Pour the mixture into a bowl, and fold in the flour and baking powder. Add the date and pear puree, mix well and pour into the greased 24cm non stick cake tin with spring back sides. Bake for 45-50 minutes. The sponge should be fairly firm in the centre and a knife should come out clean when inserted in the centre. If not, cover with foil and cook for another 10 minutes. Set aside to cool while you make the toffee sauce. Heat everything, except for the crème fraiche, in a medium sized saucepan. Bring to the boil, then reduce the heat and simmer for 10 minutes. Remove from the heat, transfer to a bowl and allow to cool for about half an hour. Whisk in the crème fraiche. Unclip the side of the cake tin and, using a large knife, carefully slice the cake horizontally into two. This is a bit awkward but do your best, and if it falls apart, who cares! It’ll all get drenched in toffee sauce so no-one will know. Clip the side back on the cake tin and pour half the toffee sauce on to the bottom half of the cake. Put the top half back on and pour over the remaining toffee sauce. Cover with cling film (if sauce is leaking, put the whole lot into a roasting tin, or large plate) and keep overnight in the fridge, unless you are serving that day. You can heat up the cake uncovered for about 15 minutes at 150 C before serving, or else serve it up cold. Whichever you prefer. We are delighted to welcome Norwegian roaster Talor & Jorgen back as our guest roaster. Really superb coffee beans and, of course, their legendary packaging makes them stand out even more. In fact, if you were looking for a nice Christmas present for the coffee-lover in your life, the Talor & Jorgen bags are ideal. Here’s a little about Talor & Jorgen’s approach to coffee: “We tried to make choosing your favourites as easy as possible, that’s why you’ll find the most prominent flavour notes in each coffee front and centre, with the origin and producer on the back. When one coffee is out of season, we will try and find another with similar characteristics so that you don’t have to go without your favourite types of coffee each morning. “Coffee is just like any other organic product. Different countries harvest at different times of the year. So we’ll have a rotating selection all year round. But the nice thing is that if you create an account with us, your selection will teach us a lot about what kind of flavours you like. So the more often you come back, the more likely it will be that we can find raw coffees that suit your tastes. “Think of it this way: you get to be part of our green buying team (just without all that international travel and paperwork). “Quality is the backbone of what we do but we are also aware of the increasing difficulty for producers to continually provide coffees above specialty standard due to pervasive disease, lack of diversity in varieties, inclement weather, transportation and drying issues. Looking for the perfect gift for the coffee-lover in your life? Or someoane you think would like to get into specialty coffee a bit more? We can help! Here’s a selection of Christmas presents now in all Joe’s specialty coffee shops (in Arnotts Department Store on Liffey Street in Dublin 1, in Kildare Village Retail Outlet, on Montague Street off Harcourt Street in Dublin 2, on Leeson Street just off Stephen’s Green also in Dublin 2 and in our new flagship coffee shop in Dundrum Town Centre. We have gorgeous gift packs specially for Christmas with a bag of seasonal beans from our house roaster The Barn Berlin and chocolate from Hazel Mountain Chocolate. As well as beans from The Barn, we have really special coffee in from Talor&Jorgen out of Norway. They’re a really special roaster and one we love working with. Their funky packaging mean they also make really nice presents. We also have coffee beans in from La Cabra which would also make really nice Christmas gifts for any coffee-lover. We now have a range of special coffee vouchers which can be redeemed in any Joe’s for coffee beans or any coffee kit, such Chemex, Aeropress, Kalita or grinders or brewers. Ideal if you’re no 100 per cent sure what the person needs or wants in coffee terms. We have a selection of the best coffee kit in all Joe’s but the grinders and brewers from Wilfa are particularly special. Really nice present for anyone who loves their specialty coffee. Our unique, specially designed Joe’s T-shirts are cool and fun ... and you don’t have to be called Joe to wear them. We are delighted to have specialty coffee beans from La Cabra out of Denmark back in our coffee shops in Dublin. We have built up a great relationship with the guys from La Cabra over the years and their coffees are always so popular with our customers. You’ll find the beans in our Arnotts shop on Liffey Street in Dublin 1 and in our shop on Montague Street in Dublin 2. They should also be in our new flagship coffee shop in Harvey Nichols in the Dundrum Town Centre over next few days as well as in our Leeson Street cafe. We have got all four of La Cabra’s current range of fantastic coffee beans . . . all by different processing methods. We’ll also run the Shembati as our guest espresso from next week. These beans are also all ‘omni’ roasts, meaning they’re good for espresso and filter too. Check out the supercool website here for more on La Cabra’s methods and philosophy. 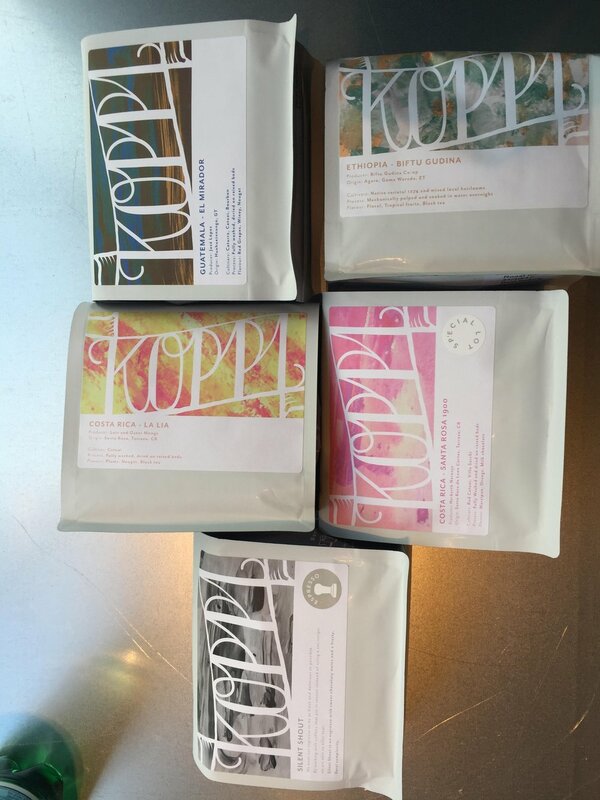 We are delighted to have the full range of beans from new guest roaster Koppi in our specialty coffee shops in Dublin city centre. After just having Assembly Roasters and then Square Mile, both out of London, we’ve been a bit spoilt for choice. So, to be able to have Koppi as our new guest roaster is just brilliant. We’re thrilled and hope you will be too as they’ve always been a popular guest here in Joe’s. We were going to tell you all about the Koppi philosophy but then we decided it might be best to let them do it themselves. And for espresso lovers, we also have their legendary Silent Shout, a sweet and floral espresso with a creamy mouthfeel. We are thrilled to announce that our latest guest roaster is the legendary Square Mile out of London. Recognised as one of the best speciality coffee roasters in the world, their beans really are the best and are always so popular with our customers. They are available in our speciality coffee shops in Dublin city centre on Montague Street and in Arnotts on Liffey Street in Dublin 1 as well as in our new coffee shop on Leeson Street just off Stephen’s Green. Red Brick (espresso; Costa Rica and Guatemala): MILK CHOCOLATE/COLA/CITRUS. Another fruity coffee from our seasonal regular Bosques de San Francisco. Hailing from the Antigua region of Guatemala this lot shows a sweet, heavy, treacly body, accompanied by fresh oranges and nutty chocolate praline flavours. This will be a real crowd pleaser we're sure! We also have the Guaracho espresso and the Ngarariga AB, Sumava Lourdes, Kayon Mountain and Juanachute filters. If you like coffee, you will love these. We are delighted to have opened a new Joe’s specialty coffee shop on Leeson Street Lower in Dublin 2. It is located in the Alchemy Juice Co cafe just up from The Sugar Club and just off St Stephen’s Green in the heart of Dublin city centre. Alchemy is still going strong but now supplies its juices, smoothies, healthy treats, soups, stews and salads to various locations around Dublin including our specialty coffee shops on Montague Street (off Harcourt Street) and in Arnotts Department Store on Liffey Street in Dublin 1. This means the new Joe’s on Leeson Street has a great selection of Alchemy salads as well as our range of special sandwiches and our own range of salads. This is all about giving the consumer – you! – more choices in what you eat. The new Joe’s also uses beans from The Barn Berlin as its house roaster and will have a range of guest roasts too. In fact, to celebrate the opening, we are delighted to say that we have one of the world’s most famous specialty roasters as our first guest, Square Mile out of London. So, see you on Leeson Street . . .
We are delighted to have a really special new guest roaster in our two specialty coffee shops in Dublin. They are Assembly Coffee out of London. Drop in and grab a bag. Love speciality coffee? 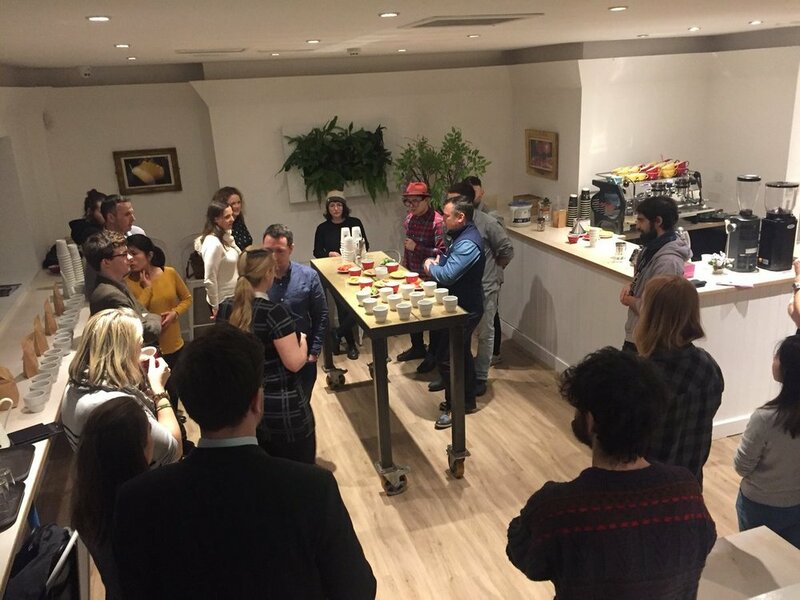 Want to work with coffee beans from guest roasters such as Square Mile, Tim Wendelboe, La Cabra and 3FE? And get to know all about The Barn's coffees? And be part of a pretty cool team? Joe's is hiring! Email your CV and a cover letter about your love of coffee to baristajobs@joes.ie now! We have some gorgeous new beans in from The Barn Berlin. They are in our Dublin speciality coffee shops in Arnotts on Liffey Street in Dublin 1 and in our cafe on Montague Street in Dublin 2 near Stephen’s Green. La Bandera: a honey-processed Costa Rican which is now our house espresso. Tasting: Macadamia nut. White honey. Smooth. Santa Rosa 1900: This Costa Rican filter is new to the Barn, but the farm it’s from always produces such gorgeous coffee. Tasting: Plum. Caramel. Rich. “Santa Rosa 1900 is a showcase for the superior processing methods in Costa Rica. The Catuai varietal has a great taste profile matching the rich, volcanic soil of this farm. It also has high yield and strong disease resistence. The farm´s micro-climate and the shade tree plantation lead to slow maturing. The result is great sweetness and cup-complexity of this coffee. This cup has flavours of plum and caramel. It has a rich mouth-feel and fantastic sweetness. The acidity gives this coffee a great texture and a long-lasting aftertaste. El Durazno: This Guatemalan filter is one of the Barn’s standout coffees. Tasting: White Grape. Peach. Soft. Nano Challa: This Ethiopian filter is another coffee that has been tasting truly beautiful in previous seasons. Tasting: Nectarine. Jasmine. Luscious. All superb and worth tasting! Joe’s is obviously best known for its speciality coffee and for having beans from The Barn Berlin and 3FE as house roasts and a range of speciality guest roasts from around the world, including Coffee Collective, La Cabra, Square Mile and Tim Wendelboe. However, thanks to our association with Alchemy Juice Co, the healthy eating restaurant run by Joe’s co-founders Domini and Peaches Kemp, we also have a reputation for healthy foods. We stock juices and make smoothies created by Alchemy and also carry a range of their salads, lunchboxes and healthy soups which are obviously hugely popular at this time of year (and indeed all year round). We also have our own salads, including the Joe’s Caesar and the Joe’s Nicoise, as well as our range of hot and cold “killer sandwiches” including the legendary Best Grilled Cheese (which has four Irish cheeses!). KALE CRACK SALAD: kale, tahini, seeds, raisins. ASIAN SALMON SALAD: chargrilled salmon, carrot strips, Chinese leaves, red & yellow peppers, courgette, spring onions, coriander, edamame beans, asian dressing and lime slices. PALEO CAESAR: free range Irish roast chicken, kale, tahini, lemon juice, garlic, pumpkin seeds, sunflower seeds, sesame seeds and tamari. SUPERFOOD SALAD: spinach, blueberries, toasted chickpeas, roast sweet potato, honeyed walnuts, sprouts, lemon & goji-berry oil, mixed leaves, spinach. PALEO POWER: leek and carrot nut loaf, cabbage and beetroot power slaw. BEEF CRACK KALE SALAD: rare Irish beef, asian dressing, Portobello mushrooms, quinoa, nutritional yeast and crushed walnuts. We are delighted to announce that our Dublin 2 speciality coffee shop on Montague Street is now open on Sundays from 10am-4pm. Located just off Harcourt Street and close to St Stephen’s Green, it is the perfect city centre location for grabbing a speciality coffee and a pastry on a Sunday morning. You can also go for the brunch option and try one of our range of gourmet sandwiches or the salads we stock from Alchemy Juice Co. We also have the full range of Alchemy juices if you need to quench your thirst. Speaking of brunch and lunch in Dublin, we also have new sandwiches and salads on the menu in our Montague Street shop as well as in our speciality coffee shops in Arnotts on Liffey Street and in Kildare Village Retail Outlet. These include the Joe's Caesar Salad with chicken and bacon, the Joe's Nicoise Salad with tuna, green beans and olives and the Joe Fo Feta Sandwich with aubergine and beetroot on foccaccia. Really tasty new additions to the Joe’s range. First we have a cold-brewed filter coffee which is a 24 hour cold infusion. We use a Tanzanian Majinja filter coffee for that. We also have a cold brew cascara and hibiscus infusion, similar to the normal cold brew; it is also a 24-hour cold infusion made from the coffee cherries. These are both served in bottles and you’ll find them stored in our fridges. Iced Cascara Sling: the hibiscus cascara infusion with some lime juice/zest and sugar syrup served in tall glass on plenty of ice. An exclusive kit comprising the super high quality Commandante grinder, a Kalita brewer and a bag of beans.